The Amazfit Stratos definitely has its fare share of flaws, but it's still an impressive bit of kit. As a tech company, Xiaomi has got its fingers into almost every facet of the industry. In India however, the company is still known primarily as a smartphone maker. But, it seems like Xiaomi is intent on changing that perception. The company has already launched its TVs here and through Huami (which it owns), the company is launching fitness-centric smartwatches. 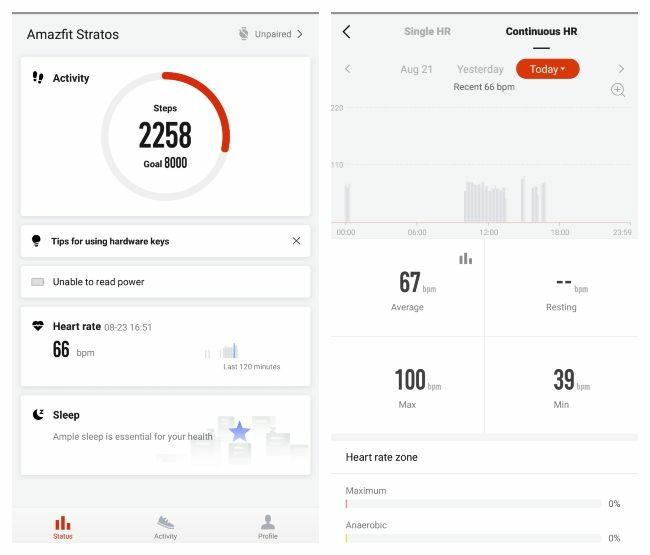 While the company did sort-of enter the fitness wearable category with its Mi Band range of devices, It wasn’t as feature rich as Huami’s Amazfit wearables. 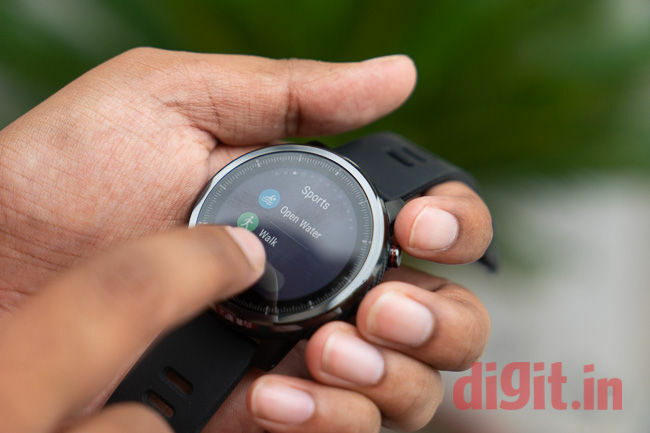 I have with me the Huami Amazfit Stratos, the more expensive of the two devices launched by the company at Rs 15,999. On paper, the device claims to offer a number of features. But are they good enough to compete against the likes of the Samsung Gear Fit 2 Pro (review) and the Fitbit Versa (review)? Let’s find out. The Amazfit Stratos wears its sporting credentials on its sleeve when it comes to design. The device is big and chunky and looks exactly like a sports watch should. However, this is a double edged sword. The big and chunky looks mean that it might not appeal to those looking for something a little subtle. If you have a thin wrist (like me), it might not look a little too large for it. Its bulk also means that sleeping with the wearable is uncomfortable, but not impossible. The Stratos features three buttons. The one on top is used to unlock the device and go back, the middle one is used to quick launch an activity and go back to the home screen. The button on the bottom is used to bring up notifications. Turn the wearable over, and you’ll come across the optical heart rate tracker. It should be noted that the watch does come with a latch to remove the straps. The latches were properly recessed into the strap itself didn’t dig into my skin at all. The face of the watch is protected with Gorilla Glass and features a ceramic bezel. 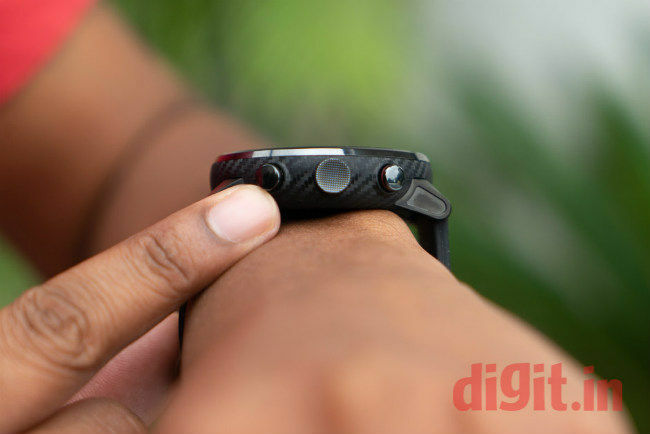 The rest of the wearable’s chunky body is made up of plastic. However, the use of plastic doesn’t necessarily mean that it has a poor build. 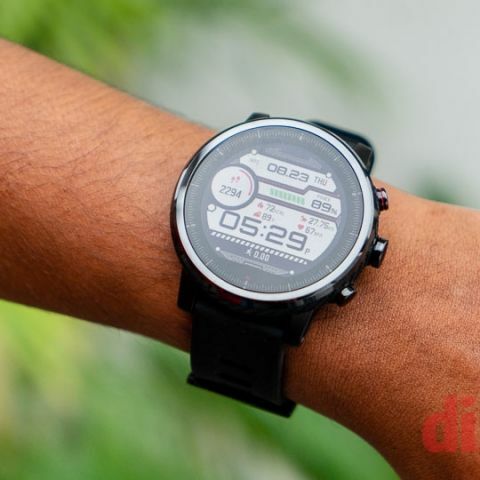 In fact, the plastic used on the watch reminds of the one used by the CAT S60 smartphone (review), and that was possibly the toughest smartphone we’ve tested at Digit yet. In fact, it also features the same carbonfiber-esq checkerboard pattern. In simpler terms, the watch seems tough, and while I wasn’t able to test its durability to the max, I did accidently bang the watch on a wall a couple of times, and the devices passed through with nary a scratch. The Amazfit Stratos is also rated to be waterproof up to 5 ATMs. Unfortunately, I wasn’t able to take it swimming with me, but I did place the watch in a bowl of water and it worked fine. The Amazfit Stratos may have a round body, but the display itself isn't round. 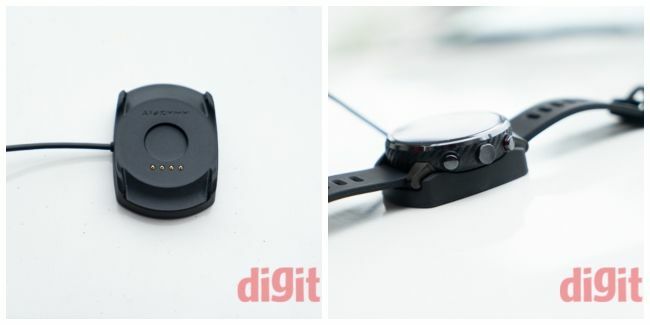 The device sports that 'flat tire’ look that Motorola introduced with the Moto 360. To be fair though, you do tend to overlook that section of the display since it doesn't seem to hide information. The wearable does sport a colour display, but the colours seem to be washed out and it isn't as vibrant as the Samsung Gear Fit 2. The brightness is adjustable by up to five levels, but there is an auto mode. The automatic system worked fine for my day to day use, and I didn't have much issues with the brightness. Even under the harsh Delhi Sun, the display was clearly legible. Honestly speaking, I have no clue how a display that looks so dull indoors, manages to be that legible in sunlight. Another nifty little feature is the always on display. When not in use, the display goes into sort of a low power mode, which means that there is absolutely no delay when you flick up your wrist to see the time. The UI of the Amazfit Stratos is a bit clunky to be honest. It took me a while to get used to navigating the interface which relies on a combination of swipes, touches and button presses. While this is pretty common with smart watches, the application of these left a lot to be desired. First off, you press and hold the power button for a second or two to go a step back, and do the same with the center button to go home. While this may not sound as bad, it's extremely clunky when you try and use it as this slows you down when using the phone. This is especially annoying since the watch has a lot of menus that you will have to swipe and scroll through. Thankfully, you can go a step back by swiping to the right. However, if you are in a sub menu, the gesture will only work if you are on the left-most option. I really don't see why Huami simply didn't let you go back or home with a single press of a button. Another annoying little feature is that by default, you cannot tap to wake the screen. While the option to turn the feature on is available, it is buried in the Settings. Even then, the tap to wake feature was quite a lot slower than pressing the power button. Huami should have allowed users to unlock the wearable by pressing any button. Coming to the swiping gestures. Swiping down let's you access Quick Access buttons like Airplane Mode, Brightness, Settings and Do Not Disturb. The latter is the most peculiar as the wearable does not come with a speaker. So it doesn't ‘disturb’ anyway. Maybe Huami has added the feature in the UI in preparation for a future smartwatch that will come with speaker. Coming back to the UI, swiping up lets you access notifications, pressing and holding the watch face let's you switch watch faces. Swiping left and right let's you access various features and features such as sports, activities, weather, heart rate, sleep and more. Tapping on any of them reveals a surprising amount of information that is displayed on the watch itself. This is pretty cool as you don't have to rely on the Amazfit Watch app to get important info. If you are a runner, you would get information like pace, stride length, speed, cadence and more. This, combined with the inbuilt GPS means that you could leave your phone behind when you go out for a run. At least in theory, because the Amazfit Stratos isn’t exactly a complete smartwatch. The Stratos may display incoming calls and notifications, but there’s little you can do with them. As mentioned earlier, the wearable does not come with a speaker, or even a microphone. So receiving calls is out of the questions. Similarly, the watch does not let you reply to any incoming notifications like messages or emails. There isn't even a way to select pre-set replies. If you are hoping to use the Stratos for these features, then you should look elsewhere. However, the Stratos more than makes up for it in terms of fitness tracking. If you are the type that does a lot of outdoor activities, then the Amazfit Stratos should be right up your alley. I haven't seen so many fitness options in a device, period. Besides your usual suspects of walking and running, you got indoor running, cycling, indoor cycling, trail running, climbing, and more. If you're into specific sports, you can choose tennis, soccer, skiing and even triathlon. Since the wearable is waterproof, you can take it swimming too. Even there you get the option of pool swimming and open water swimming. It's insane. In fact, there is only one thing missing from the list and it's workouts. I don't run, and I haven't cycled since a thief stole my bike (doom on you thief! ), but I do workout a little bit. And there surprisingly wasn't an option for that. Nor was there an option for lifting weights. So, gym rats may not be too happy with this. For my tests, I started tracking my walks to and from the metro and it did a very good job with that. It gave me my steps, calories burned, average stride length, cadence, pace, and more. It also graphed out the route I had taken during my walk. Although that graph made little sense when viewing it on the wearable as it wasn’t laid over a map. That is rectified in the Amazfit Watch app, where it is laid over a map, thereby giving you a better understanding of the route. I would have liked it if the ‘mapped’ view was offered on the watch itself, similar to what the Samsung Gear Fit 2 Pro offers. Maybe after the wearable pairs with the smartphone, it could download that part of the map. But for know, that is not the case. 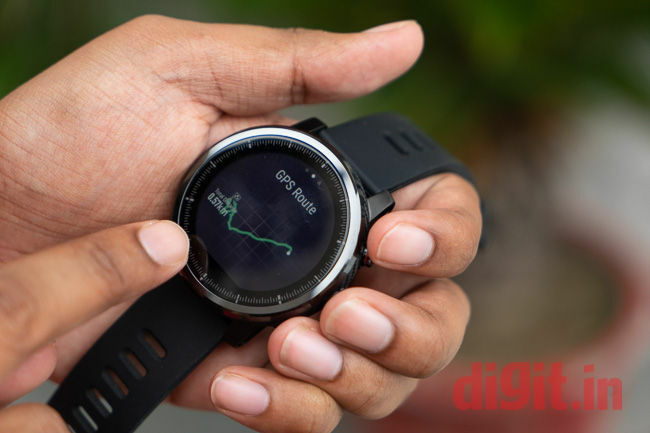 Interestingly, it should be noted that the watch takes about a minute or so to connect with a GPS for positioning. Till that time, your route is not tracked. So one should keep that in mind before starting any activity. As for the route tracking itself, it accurate down to a couple of meters, which is not too bad. Funnily enough, it’s very easy to mess around with the tracking. I turned it on when i boarded the metro once, and it continued to track all the way till I reached home. This lead to some pretty interesting stats such as a maximum walking speed of about 70 km/hr and an average walking pace of about 3 min/km. I did the same with swimming and it detected that I ‘swam’ over land to the office. To be fair, this isn’t something new, many GPS enabled trackers seem to get fooled by this including the Samsung Gear Fit 2 (review). While I appreciate the fact that manufacturers and developers feel that the human body should not be bound by any physical limits. I think it would be smarter for trackers to automatically stop/pause tracking when it detects anomalies in certain activities. Similar to what Pokemon Go does when it detects that you are in a vehicle and if that app can do it, these trackers should be able to do the same. It should also be noted that the Amazfit Stratos does not automatically detect workouts. This was kind of a bummer considering that many other trackers in this price range are able to offer this feature. The Amazfit Stratos comes with its own app called Amazfit Watch (surprise!). The app is pretty straight forward. When you start the app, you’ll be shown the steps, heart rate, as well as sleep tracking. Swiping to right lets you take a look at the activities that have been tracked. These activities are also divided on the basis of spots. Tapping on any particular activity lets you access all the data in detail. This is also the only way to see the tracked route overlaid on a map, giving you better information about your activity. You also get options with the map itself. This includes Kilometer markers, as well as the option to overlay a satellite map. The app is also very detailed and gives you more information than you can shake a stick at. This includes mileage, calories, pace, speed, heart rate, heart rate zones, cadence, and stride. Swipe to the right and you get trips, in which your activity is divided into Kilometers and the time it took you to cover that distance. Swipe to the right once again and you get graphs for speed, heart rate and cadence. Swiping to the right once again will take you to your profile, where you will be able to access settings as well as your information. The app itself is quite straightforward and works fine. The sleep section lets you know the when you slept, how long you slept, as well as how long your deep and light sleep was. You can also see the sleep information divided weekly or monthly. Same thing holds true for heart rate tracking. You see your average as well as a maximum/minimum heart rate for the day. This can also be divided into weeks and months. When it comes to battery life, the Amazfit Stratos does not disappoint. 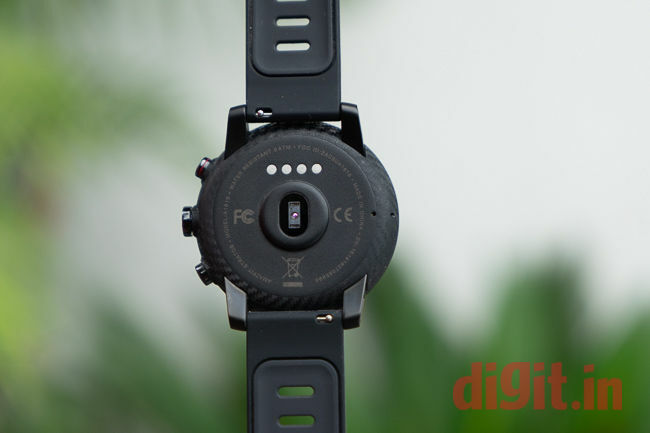 The device managed to offer four days of battery life with continuous heart rate tracking. This is pretty impressive and close to what the Fitbit Versa has to offer. It also beats the Samsung Gear Fit 2 Pro, which offers a 2.5 day battery life at most. The charging cradle of the Stratos is one of the most unique ones I have seen. At first glance, it looks like a magnetic cradle, but it isn’t. You’ll have to push it into the cradle and then it sort of clicks into place. To remove the watch, you have to yank it out. I always fiddled around a bit when it came to attaching it. However, once attached, it was held in place quite securely. 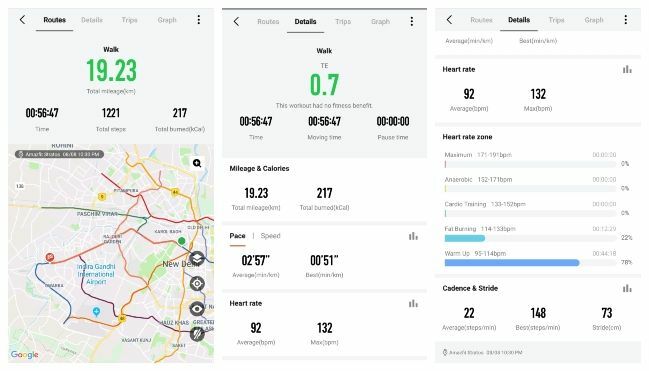 The Amazfit Stratos definitely has its fare share of flaws such as the lack of auto tracking and especially its UI. But, it's still an impressive bit of kit. The wearable seems to be aimed at the ‘outdoorsy’ type and in that respect, I think that it has hit the target. The sheer number of activities and metrics it can track has blown me away. Add to this impressive battery life and the surprisingly legible display make its a good choice for anyone whose idea of fitness to head out into the open outdoors. However, if you tend to work out in the gym a lot, then you’re better off playing a few thousand bucks more and getting your hands on the Fitbit Versa or the Ionic. Which application is best for the puzzle type of games in Samsung? Which application is best for the puzzle type of games in blackberry? Does anyone help me out with a review for the Firefox OS?